Please, HELP ME FUND MY FIRST TWO BIG SOLO MUSEUM SHOWS and establish my studio gallery in Singapore. 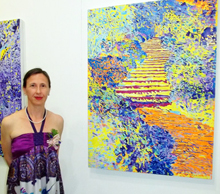 I am a Slovenian-born, international emerging artist known for my large paintings painted with bright colors, vivid atmospheres of gardens with lush vegetation and bright light. I work betwen Europe & Asia. I am represented by Momentous Arts Galery in Singapore. I have 2 big solo shows in Nov.-Dec.-Jan.: at Chiang Mai Contemporary Art Museum and Jamjuree (State) Gallery in Bangkok & publishing of 2 books. After price of my work will increase 30%.